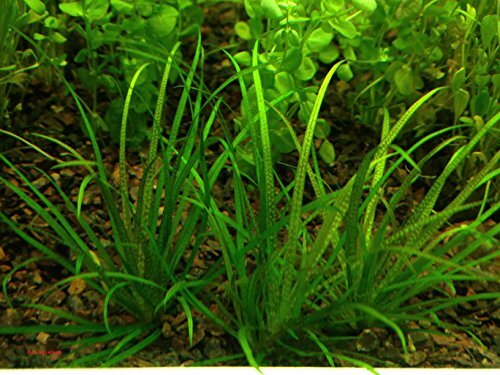 Blyxa japonica is a very popular plant among aquascaping fans. It always draws the eye due to its thick bright rosette. One may say that Blyxa japonica forms hillocks with tangles: it has a stem about 10 cm long with light green leaves that grow in all directions. These hillocks can be placed both in a center of the composition – as a focal point and along its sides making the whole composition look more extensive. Blyxa japonica can be also cultivated as a ‘carpet’ with high stems. Blyxa japonica is a green good-looking stem and leaf plant, which is more spread in South Asia. It is more often encountered in Japan, China and Taiwan. This aquatic plant had become extremely popular when it was first introduced in aquarium husbandry in 1990. Since then its popularity has been changing wavily mainly due to the appearance of new species that can be placed in front of aquascapes which gradually became available for aquarists. Blyxa japonica is a stem aquatic plant with thickly growing light green leaves and a strong root system. It grows both widthway and lengthway up to 15 cm (6 inches). It blooms with white, small flowers on its thin stems. The leaves may grow up to 15 cm (6 inches) long and 3-4 mm wide. Their color may vary from green to golden red. The more intense the lighting is, the more reddish color Blyxa japonica demonstrates. Though Blyxa japonica resembles fluffy bushes of grass. In fact, this is the plant with a stem and exquisit thin leaves. The plant has a stem, but its leaves just grow too close to each other and they have short internodes, which makes it look as a thick bush. Such a structure determines some peculiarities when taking care of the plant rosette. In time the plant changes its appearance – its bottom leaves rot off and one third of the stem becomes bare. Though its bushy rosettes aren’t large (up to 15 cm high), due to the fact that its stem slowly but gradually grows, the base of the rosette shifts higher and higher. Under it you can see an empty space under the thick stem without leaves. In this case you should do as follows: carefully cut the plant stem under the bottom leaves and remove its bare part with roots from the substrate, then plant the living bush so, that it won’t float in the water. Some time later the stem will grow a thick creeping rootstock, which you should feed with fertilizers containing organics. Blyxa japonica is a tank plant of medium difficulty in keeping. This plant can’t be called an easy one to keep or be recommended for beginners to have in their amateur tanks. This is due to Blyxa japonica capriciousness. Provided with improper care and keeping conditions the plant just dies. Blyxa japonica is moderately demanding aquatic plant which requires good illumination, CO2 supply and additional nutrition with fertilizes which promotes the best coloring of the plant. Only then the leaves get their maximum length and form a thick ‘brush of leaves’. The feature of the plant is its requirements to the substrate – it should be silty or have a base rich with nutrients. Unless this requirement is met, even if the tank water has lots of microelements in it, still the plant will grow smaller and float up to the water surface. Besides, the tank water should be soft, since in hard water the plant demonstrates poorer growth rate and usually just dies. Blyxa japonica prefers acidic water, bright direct light and substrate rich with nutrients. In well illuminated tanks with sufficient amount of ferrum in the water Blyxa will demonstrate saturated golden reddish tint on its leaves. In less illuminated tanks it shows nice green coloring. If you maintain phosphates level high, Blyxa japonica will constantly bloom with small white flowers on long thin stems. Even though Blyxa japonica requires tank conditions of medium difficulty, it grows quite fast and simple. Unlike other herbaceous plants used for middle and front stage, it doesn’t have long shoots. Instead of this it grows a lot of spurs which can be easily cut off from the parent plant with scissors. Relocation of these spurs may be a bit troublesome, since they have high buoyancy in water which, at first, causes difficulties to fixate them in the substrate. But once Blyxa japonica strikes roots, it will actively develop its root system and grow spurs forming a large bush. It is not difficult to plant Blyxa japonica: you should put its sprigs into the substrate where they will strike roots. The substrate should be about 3-5 cm thick. Young spurs require silty soil rich with nutrients, that’s why you should supply the plant with fertilizers.